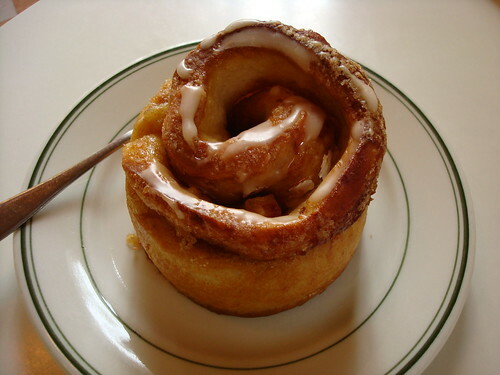 Caffe Ladro: Though mostly known for its coffee, Ladro is an established bakery in its own right: they have their own commercial bakery in West Seattle, at which baked goods are made daily for all of their Seattle locations. Ranging from dense vegan oat bars with a tart rhubarb layer to buttery scones and a gorgeously crumbly cardamom coffee cake, it's worth a visit even for non coffee drinkers. Two Queen Anne Locations: 600 Queen Anne Ave. No., and 2205 Queen Anne Ave. No. ; online at caffeladro.com. Crow: Though we don't frequently feature restaurants (we don't feel as comfortable talking about the meal before dessert), this one is an exception. When Head Spy Jessie moved to Seattle on a whim and found herself jobless, she waited tables at Crow in lower Queen Anne. Though no longer waiting tables there, we all still enjoy their house-made desserts which will range seasonally--offerings might include a house-made strawberry ice cream, rustic cobbler à la mode or a sinfully rich chocolate cake. We like to sit at the bar where it's OK to order dessert only! 823 5th Ave. No., (206) 283-8800. Eat Local: Desserts made with no artificial sweeteners, no refined sugar, and all-local ingredients? Sounds suspect, we know, but as proven by our recent week-long Eat Local Challenge, sometimes local is a good thing: ranging from the surprisingly light honey-lemon cheesecake to crumbly shortbread and toe-curlingly delicious chocolate decadence in their "takeaway" dessert case, Eat Local offers some treasures on Upper Queen Anne. 2400 Queen Anne Ave. No., (206) 328-3663; online at eatlocalonline.com. El Diablo Coffee Co.: Aside from serving a spicy mocha made with Mexican chocolate that would make even a black coffee drinker a believer, they've got some killer desserts--Tres Leches Cake, Red Velvet, and a rotating cast of tarts, pots de creme, and other delectable treats. The desserts are supplied by another Seattle Bakery, Bella Dolce, but the ambiance is far better at El Diablo, with a warm, lived-in interior and cute hipster employees. 1811 Queen Anne Avenue N., (206) 285-0693; online at eldiablocoffee.com. 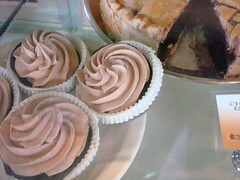 Macrina Bakery: Macrina can be a strange beast, inspiring either fierce love or instense disdain amongst Seattleites. It's an acquired taste for certain--their cakes aren't as sweet as some of their other commercial counterparts, and their "short" scones do tend to crumble differently than the sweet ones you'd find at say, Starbucks. And to put it bluntly, their coffee is...not good. But while our Cakespy crew doesn't love everything at Macrina, the good stuff is truly, genuinely good: rich cupcakes that blur the line between cake and truffle; beautiful iced shortbread, and perfect buttermilk biscuits with jam in the morning. 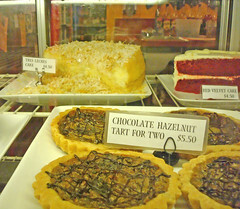 Queen Anne Location, 615 W McGraw St., (206) 283-5900; online at macrinabakery.com. Metropolitan Market: Sometimes you want to go where everybody knows your name, and Metro Market is that place for us. Located one block away from Cakespy Headquarters, this is the place that fuels our immediate sugar needs, with a surprisingly good on-site bakery, and also a large selection of pastries, ranging from local bakers like Alki Bakery, EATS Market, Essential Baking, Macrina--to baked goods and pastries from the likes of Poilâne Bakery and Cheesecake from Junior's in NYC. Swoon. Two Queen Anne Locations: 100 Mercer Street, and 1908 Queen Anne Ave. No. ; online at metropolitan-market.com. Morfey's Cake Shoppe: True, Morfey's is a special-order cake bakery (alas, no rows of cake slices or cupcakes for those just walking by), but is certainly worth mentioning. They've been around forever, and it shows, with light-as-air cakes topped with whipped buttercream frosting which invoke instant taste nostalgia. Just walking inside will give you a buzz--with just a tiny meeting area in front of the large commercial ovens, the air is thick with the smell of cakes baking. 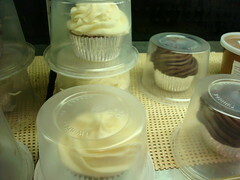 110 Denny Way, (206) 283-8557; online at morfeyscake.com. Nielsen's Pastries: Though this one can be hard to hit due to their bankers hours (7:30 a.m. - 3 p.m. Mondays, 7:30 a.m. - 5:30 p.m. the rest of the week, 8:00 a.m. - 3 p.m. Saturday, and closed on Sunday ). Nonetheless, if you find yourself here during a trip or if you're local taking a "mental health day" from work, it's worth a visit, with rich, cream filled pastries, Danish specialties and cookies like mom made--but better. Our picks are the oozy, glazey, fantastic cinnamon rolls (picture top), and the "Potato"--think of a creamy, rich, custardy eclair, then top it with a marzipan jacket and a dusting of cocoa. One Sweet Potato indeed. 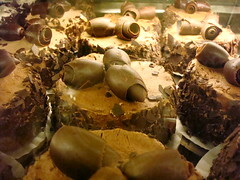 520 2nd Ave W, (206) 282-3004; online at nielsenspastries.com. Pasta + Co.: When you see the the gorgeous pasta displays and splendid array of olive oils just keep on walking--they'll only divert you from the wonderful (made in-house!) 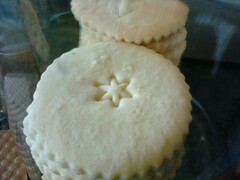 lemon tarts, as well as creamy, dreamy cupcakes and sweets supplied by excellent local baker T.M. Dessert Works. 2109 Queen Anne Ave. 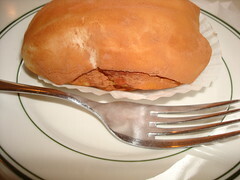 No., (206) 283-1182; online at pastaco.com. QFC: Yes, QFC is a grocery store chain and part of the Kroger family. But we're not scared to admit that their bakery has what in our opinion is a surprisingly toothsome and tasty nanaimo bar. You'll also always be able to find a pink frosted cookie here, but not much else in their baked goods case is worth a mention in our opinion. Queen Anne Location, 500 Mercer St., (206) 352-4020; online at qfconline.com. (206) 283-5931; online at seattleteacup.com. 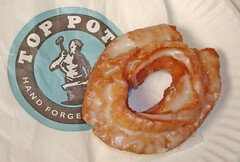 Top Pot Doughnuts: Continuing their slow but steady quest in taking over the doughnut world, Top Pot just opened a new location on Upper Queen Anne, which can be teeming with families on the weekends, but is rather pleasant on weekday afternoons. While we won't say they're the best we've ever tasted, they are very, solidly good, and very dependable; also, their displays, with doughnuts like the "Pink Feather Boa", never fail to brighten our mood. But if you prefer Mighty-O's vegan donuts, they have them across the street at Caffe Fiore. 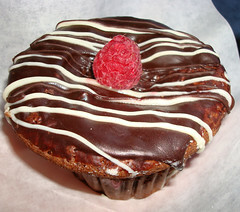 325 West Galer St, (206) 728-1986; online at toppotdoughnuts.com. Uptown Espresso: Like Ladro, Uptown Espresso's baked goods are their own creations. While we can take or leave their scones, we've had very good experiences with their iced "loaf" cakes (try the pumpkin if it's available) and with their buttery, shortbready sugar cookies. Good Americano too--in the mornings, barista Kelly (on the right side) always makes us smile. 525 Queen Anne Ave No., (206) 285-5663; online at uptownespresso.net.